Since the beginning of December 2014, Weather in Bali is always there was heavy rain. In some places always rains. Rain occurs from day to night. The intensity of rain is very very heavy, sometimes drizzle but do not stop until the afternoon and evening. Weather in Bali are always rains in December of this year resulted in flooding in the city up in the village. In Denpasar always floods. 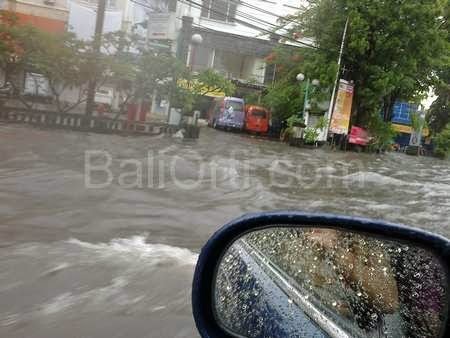 Not only in the economic and business center, flooding also occurred in Sanur, Denpasar tourism in the city center. Flooding occurred on the road, so the traffic jams occur. Causes current to non-current vehicles. Even many cars does not become damaged and can not be turned on by flood. Traffic becomes chaotic, then the vehicle is very slow and slow. Most of the causes of flooding in Bali is poor drainage, and trash that clog drains and sewer drains. Drains were clogged due to garbage piling up in the gutter. Residents around throwing garbage in the gutter, janitor accidentally throw garbage into the gutter. December is the holiday season. This year, Bali has a lot of holidays. Galungan, Kuningan, Christmas, New Year, all day for a holiday. Residents take advantage of the holiday to Bali traveled, shoping to the mall, and visiting relatives. That's what led the way in Bali became jammed during floods.